En route from Indiana to the Canadian Rockies in Edmonton, Alberta (where our vacation technically began), we saw lots of fun things along the way. 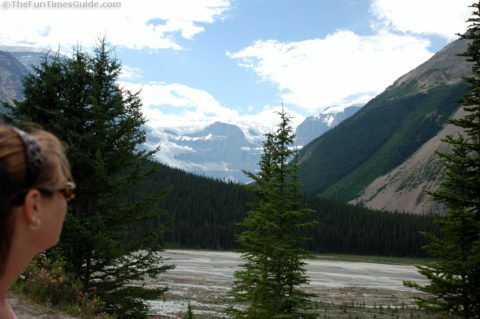 I’ll save the majority of photos showing the beautiful scenery from the Canadian Rocky Mountains and all of the incredible wildlife we saw for a separate post. 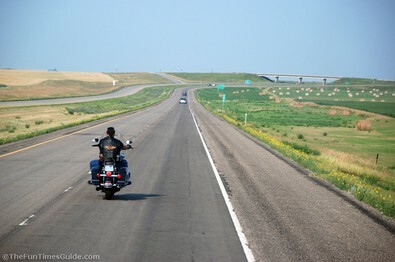 What follows here are some of the hit & miss photographs we shot between Indiana and Alberta Canada. I don’t know these people, but they were the only 2 cars next to us in line waiting to cross into Ontario, Canada. (The first day, when we were headed to the races.) There were tourists galore and everyone was snapping photos of the border crossing. Once we actually hit the road toward our vacation destination in Canada (via the North Dakota border crossing), this is what we saw most of the trip: a lot of rolling hills, bales of hay, and wide open spaces — especially from North Dakota and into Canada. Not until you reach Edmonton does the scenery change. All along the way, there are tons of gigantic windmills and oil wells pumping oil. Wood things. 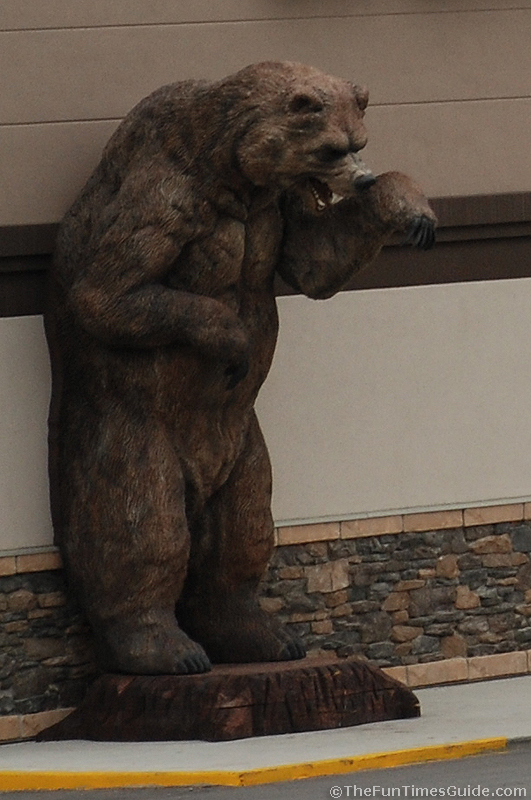 We saw lots and lots of wood carvings like this bear which stood in front of a supermarket. But the Canadian wood carvings paled in comparison to all of the carvings we saw back in Amish country… near Elkhart, Indiana. There, oversized wood carvings appear in peoples’ front lawns. Yep, modern day (classy) yard art. 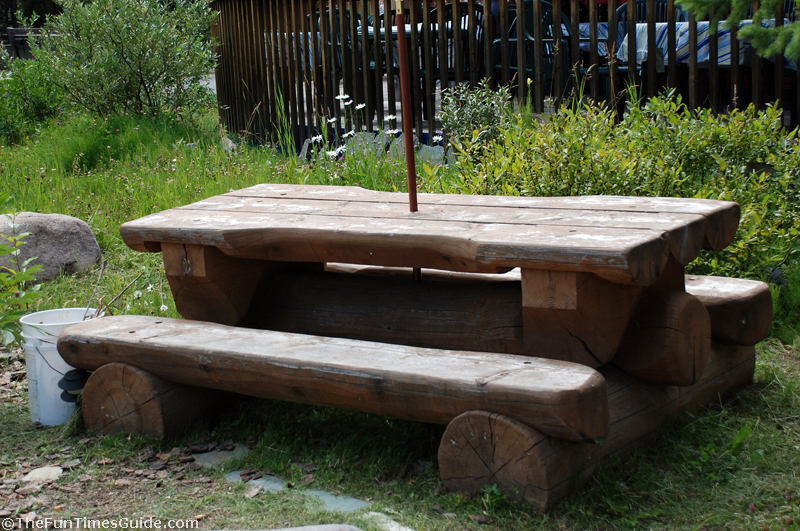 I’ll take on of those log picnic tables though! It was interesting to see all of the activity along the railroad tracks which run from North Dakota into Saskatchewan, Canada. Not only were there many trains, but also lots of men were working on the tracks. The sunsets were absolutely brilliant each night… especially the closer we got to the Canadian Rockies.Oh, and did you know that it doesn’t get dark in Alberta Canada until around 11PM?! Both of these sunset photos was taken around 10 o’clock at night. The awesome views continued with huge rocky mountains, crystal clear creeks and streams, lemonade-colored lakes and some aquamarine-colored ones too, plus thousands of RVs and motorhomes roaming the countryside in the Canadian Rockies. There were even ice glaciers with snow & ice hundreds of feet thick on them… melting ever so slightly over time to create the pools of water below them. 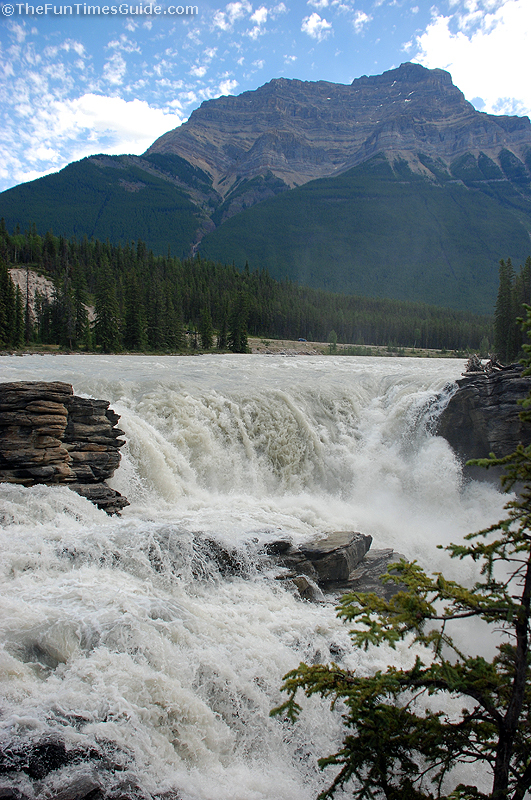 Roadside waterfalls were plentiful through the Canadian Rocky Mountains. There were even a few pull-offs with large parking areas to view some of the waterfalls that weren’t necessarily close to the road. 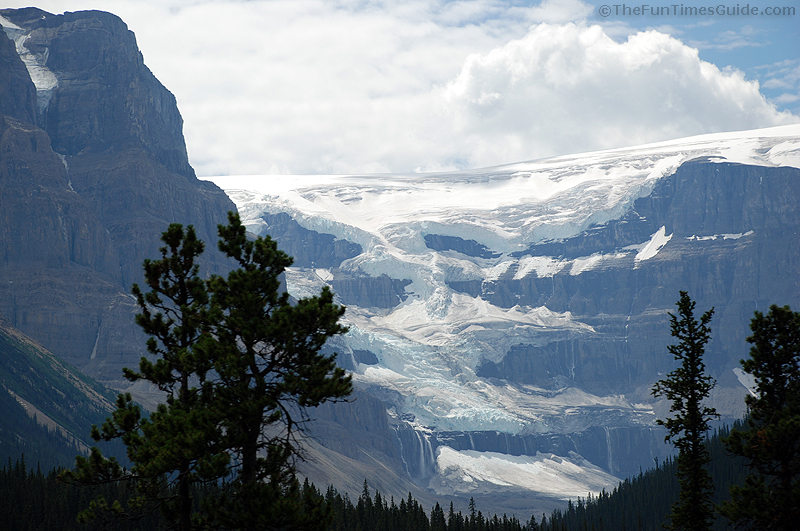 After the Rockies, we went onto Banff and then Calgary — which is where we flew out of. 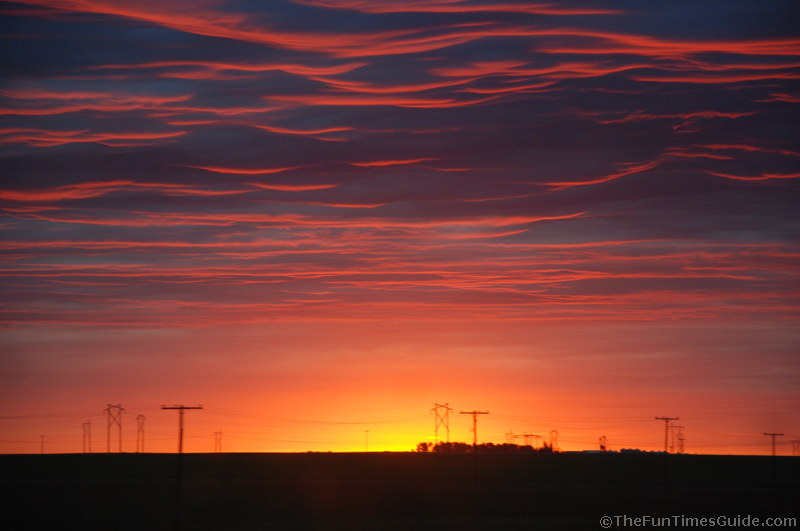 In Calgary, it happened to be the “Weekend to End Breast Cancer“. There were ladies in hot pink attire on a mission all over downtown Calgary. And if anyone’s looking for a job… you might consider moving to Canada. There’s a labor shortage there, and signs advertising available positions appeared everywhere you looked in Ontario (Grand Bend) and Alberta (Edmonton and Calgary). The rates they were advertising ranged from $11/hr to $17/hr …and that’s for places like McDonald’s!